PRIMETECH offers complete range of liquid JET EDUCTORS to meet various industrial needs and applications. Mixing aqueous solution of Fertilizers, Pesticides etc. The liquid jet eductor enables to lift, entrain and pump out a low pressure liquid utilizing a high pressure motive liquid. 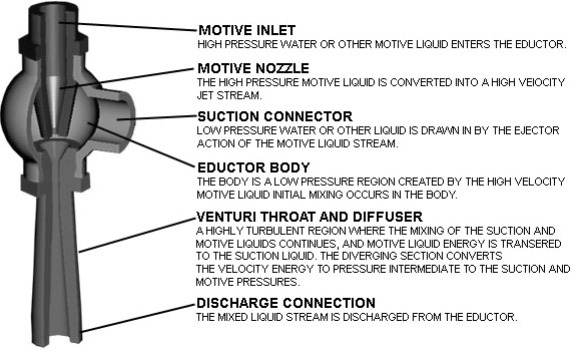 The high pressure motive liquid enters the motive chamber of the eductor through a converging motive nozzle. At the eductor nozzle, the pressure energy of the motive liquid is converted into a high velocity jet. The momentum present in the motive liquid is transferred to the suction liquid thereby enabling a LIFT, entrainment & mixing. Thus the high velocity motive liquid mixes with the suction liquid and the combined streams then enter the venturi throat and diffuser section where the mixing continues. Velocity energy is converted to a pressure intermediate to the suction and motive pressure. 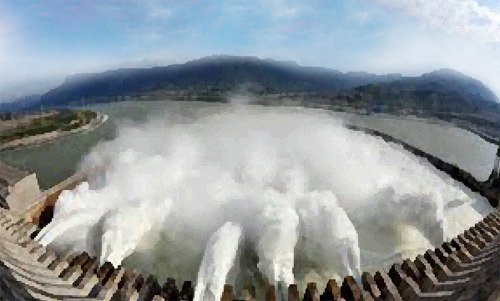 Leaks around water seals and glands are unavoidable in hydroelectric power plants. Continuous evacuation of these pits are necessary for trouble free operation of the power plant. Traditionally these collection pits were emptied by centrifugal pumps.However,there are numerous sources of high pressure water in the power plant which can act as a driving agent for a liquid jet eductor. Boeing Fouress approached Primetech for a custom-de- signed water jet eductor for this application. Based on the inputs given by Boeing, Primetech designed a high-efficiency bespoke liquid jet eductor with driving conditions of 18 m3/hour at 20 Bar capable of evacuating the entire collection pit in 1 hour.The liquid jet eductor delivered the output to a vertical discharge point 20 meters above the pit into the river. The eductor has no moving parts that require routine maintenance.